When Syriza emerged as the largest party at the election on 25th January I smiled. 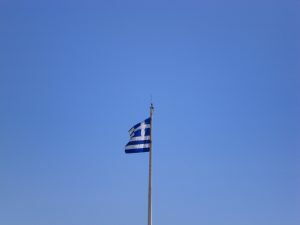 That’s the end of New Democracy and PASOK, a time to turn the page, for Greece to be able to make a new start, I thought. I bet a bunch of traditional social democrats in positions of power loathed your success, but I know a fair few folks across Europe who were ready to give you the benefit of the doubt. Appointing Yanis as finance minister seemed a clever move, while his mastery of Twitter, choosing to fly economy, and no-ties dress sense endeared him to many. You had made the moral case – crushing austerity in Greece had to end. Thousands living without electricity, or needing citizen-run clinics and soup kitchens is unacceptable within the European Union. No-one can dispute this. The targets of your critique – the troika that had imposed swingeing cuts, and previous Greek governments that had allowed these to be borne by the poorest in the society – were understandable. Removing the metal barriers at Syntagma Square, and reinstating government cleaners were neat symbolic decisions at the start. That you chose the Independent Greeks as your coalition partner raised some eyebrows. Yes, they oppose austerity, but they are close to the orthodox church and their leader Pannos Kammenos seems to be an anti-semite. Why you chose to work with them, rather than The River, seemed odd. That you needed to make a government quickly was understood in Brussels, so you were given the benefit of the doubt, but perhaps this choice was a sign of what was to come? Appointing an all-male cabinet was also not a smart move, not least considering how important gender balance is to your comrades in Spain. What has happened since – seen from the outside anyway – looks like you are stumbling from one crisis to another. Considering that Syriza was in the lead in the opinion polls from the end of 2013, it should not have been a surprise that you managed to gain power. Yet it looks to the outside like you had scant little plan as to what to do with it once you got it. Wolfgang Schäuble might be a bitter old man, but public spats with him are not handy, especially when the German press is dead set against you. Threatening to seize German assets in Greece is not helpful. Playing brinkmanship with the submission of reform lists is not going to win you friends. Mixed signals from within Syriza about what your demands are – with contradictory demands communicated – make it hard to know what you actually want. That it took you until the end of March to look like you were interested in dealing with tax evasion looks odd. Yanis might have survived the Stinkefinger episode (the video was faked), but the Paris Match photoshoot was not a good call. The biggest error of all though has been the incessant talk about World War II reparations from Germany. This is an ‘open wound‘ according to Costas Isychos – yes, because Greece keeps on opening it! Even using civil service time to calculate a sum owed by Germany – a sum that conveniently happens to be just above the amount Greece owes its debtors – is a questionable use of public resources. The phrase ‘don’t mention the war’ is sometimes said a little sarcastically in Brussels, but there is meaning to it – the European Union has allowed Europe to move on after World War II. Animosities are left to rest, and a spirit of cooperation has largely been fostered. Yes, Germany may have behaved wrongly towards Greece since 2008, but two wrongs do not make a right. To solve Greece’s economic woes while remaining in the Eurozone is going to need Germany on your side; talking about war reparations is going to have precisely the opposite effect. As if that were not enough, Alexis goes off to meet Vladimir Putin. Yes, Putin might sound more generous than the EU, but his aim is to further split the EU, and he is a despot. One of Syriza’s key arguments is that the democratic will of the Greek people, expressed at the January elections, should be respected – how does it then look to be cosying up with anti-democrat Vladimir? Both the reparations issue, and visiting Putin, make it look like Greece is externalising its problems. Blame history, and seek help from someone more friendly. The appeal of these routes might be strong, but they are no substitute for getting things right internally in Greece – stamping out corruption and tax evasion, reorientating the budget away to assist the poorest people, reducing Greece’s debt, and allowing the Greek economy to grow (there are some signs of life). Put this another way, if Greece looks like it is serious about trying to sort its own problems, there might still be the good will within the European Union to assist. Point the finger and blame, or turn to Russia, and reserves of goodwill shall disappear ever quicker. It’s been pointed out to me on Twitter that it is not decisively known if the Stinkefinger video was faked or not. This SZ piece gives the case for and against, and The Local summarises it in English. This of course leaves open the question as to whether Jauch should have used the video in the first place… but that’s another issue. I see a fundamental flaw in your address to the two gentlemen, Jon: they are two completely different characters and if my superpowers are to be trusted, the oscillation of Greek govt.’s messages has been due to the gap between them. The narratives they create are the exact opposites of one another. @Ralf – but as far as I am aware we are not certain that it was not faked by someone else? That has not been ruled out…? The finger video was not faked. The tv station that aired the (very well done) “it was faked” video said this clearly afterwards, pointing to the fact that the latter was shown in a comedy / satire show. yes, another example in the missing link of left revolutions, starting with the french. The riddle of promises, expectations and frustrations. Restrukturing the people will allways make situation worse for a time. Without integrating Antonio Gramsci in our talking the wheel of revolution will have no grip.